You’re driving on an open highway, with plains extending either side of you. There are sheets of rainfall a way off and mist coalescing into a central vortex of vertical, upward-moving rain. This is a video, displayed on a huge screen. The storm is contained and centred, we move around it rather than it moving around the frame or through the space, with dark green mountains at the furthest point of our sight. The environmental phenomenon captured is a supercell—an extreme thunderstorm. Thunderhead shows us a violent rupture from the environmental norm. 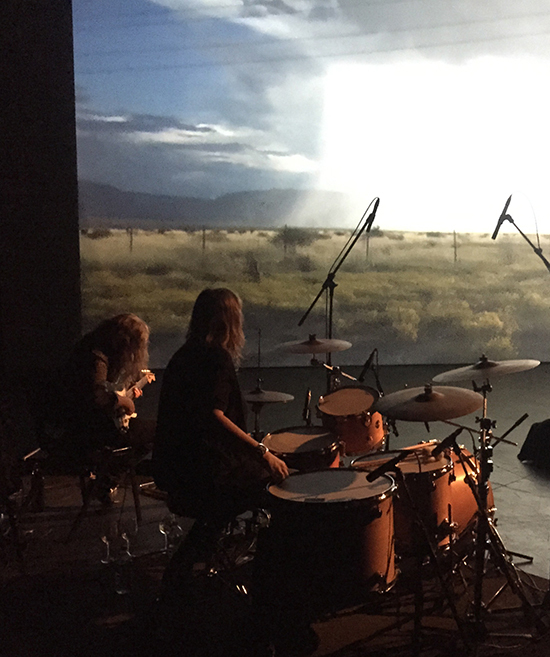 The artist, Tina Havelock Stevens, performed an iteration of the work at Performance Space’s Liveworks, accompanying the looped thunderstorm video on drums, with Liberty Kerr on guitar. 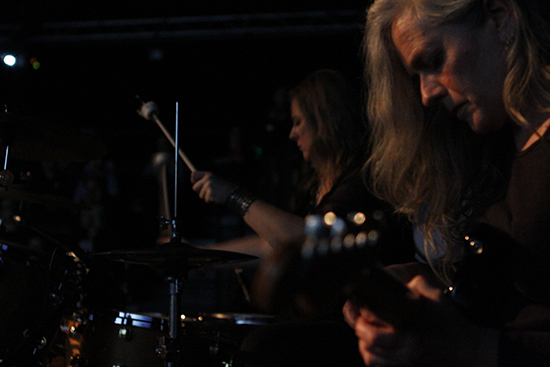 The music is improvised, mostly minor key, mostly slow, with occasional moments of upswing when Kerr chords forcefully and Havelock Stevens rolls, drops and throws a big soft mallet across the large toms, with big intermittent blustery bass kicks. There are great pillows to lie on and watch the storm roll by, which is pretty nice and allows you to space out for as long as you wish rather than analyse the work. Many will describe Thunderhead as cinematic, because it is a moving image work of a wide vista accompanied by an airy, atmospheric soundscape, but I think it is more painterly in the sensibilities of its framing and treatment of light and colour. The Texan setting is a little reminiscent of some south-eastern parts of Australia, in that it shares a high yet soft light, and the droplets of rain in the air create a dispersed screen through which the light trickles. A friend with whom I attended one night of the performances said she found the loop, and the fact that we never went into the storm’s eye maddening (unlike Francis Alÿs’ Tornado, Milpa Alta, 2000–2010), but I didn’t have a problem with that ‘on the cusp/on the outside’ feeling. Havelock Stevens has said that her encounters with land art on the same trip on which the footage was taken have informed the work’s sense of scale and repetition in how she cut and looped the video. Land art aside, Thunderhead also naturally draws on audiences’ familiarity with art history’s depictions of the sublime: that Romantic notion that overwhelming art encounters with nature—tall mountains, stormy waves, towering clouds, deep fogs—connect us to larger faiths. There’s no doubt that Thunderhead follows that continuum, albeit without the religious heaviness of church ceiling frescoes or Friedrich or Turner paintings. Rather than deliberately drawing a thematic link to the sublime, the artist has gone for something more enigmatic and porous, and I think Thunderhead is stronger for that breathing space. The airiness around it is deeply attractive to me as a viewer, because it means the artist is letting the work wrap itself around me in a unique way that makes sense only to me and will be different for you. The emotional makeup of this work is strong but in a very open-ended way, and for that reason, I’m loath to give you a sentence along the lines of “the work is about [blank],” and would much rather talk about how the work felt and the associations it triggered. Without art terms like “the sublime,” Thunderhead reminded me that two-dimensional images of light and landscape, of storms and other natural and environmental phenomena, form something of a universal visual language that can communicate both directly and obliquely to an individual. I think because the work comes from an actual encounter of being in the world rather than an academic or studio practice, it speaks to pre-intellectual forms of knowledge beyond verbal language. That wordless, feeling element of Thunderhead made me wonder about the extinction of affect in contemporary art. I have become increasingly surprised that more artists and curators do not make an effort at human connection, do not aim for inherently emotional and immersive works that move toward the viewer and offer the chance of a moving experience. Not that these are the only valid types of art, but there is such a dearth of them. So much contemporary art is made from theory, a self-examining approach which, to paraphrase New York Magazine critic Jerry Saltz, “is far too tight to let real art breathe.” Thunderhead is made from instinct, while staying grounded in art history and Western formal approaches to depicting landscapes in one-point perspective. It has that sense of pure intentionality, lending weight to the idea that creativity probably comes from a place we don’t know. It recalls road-trips, the erotics of open space, pure colour as shown by Abstract Expressionists, the bigness of everything, Impressionist interpretations of light, the smell of rain and holidays where you finally have time to think. But those are just what it made me think of: Tina Havelock Stevens has ‘merely’ established a constellation of audiovisual forces that viewers can do something with themselves, and though art’s job has changed a lot since those peak sublime times, that remains a really lovely thing to do.